Fever-range, total-body hyperthermia has the role to restart the immune system. Practically all cancer patients have a lower than average core temperature and are unable to develop a fever—thus they are unable to activate their immune system. To reactivate immune function, a controlled fever is induced to artificially heat the body—this process is known as therapeutic fever. Fever-range, total-body hyperthermia (or whole-body hyperthermia) is a nontoxic treatment that is often linked to improved temperature regulation in the body. The treatment is well-tolerated by practically all patients, and can be provided in combination with a range of other therapies. The goal of hyperthermia in oncology is to induce a fever state that will activate the immune system, and destroy the cancer cells. In total-body hyperthermia, short-wave infrared radiation penetrates the skin and warms blood vessels close to the surface of the skin. As the temperature rises in the skin and the blood flowing through the skin, the warmth spreads throughout the body, and core temperature begins to increase. Infrared light is one of the primary means used to heat the body in total-body hyperthermia. As the heat is gradually increased, the patient begins to perspire but without airflow, evaporation cannot occur. Transpiration and perspiration only lead to cooling if the water can be evaporated. Perspiration is our primary means of maintaining stable body temperature. Without this process, body temperature continues to increase, raising core temperature, and inducing a fever-like state. Once the fever is reached and maintained for one to two hours, the heat is very gradually reduced over the course of another hour or two. In the Gorter Model, directly after total-body hyperthermia treatment, patients receive an injection of Immune restoration vaccine cultured from their own blood. They usually experience mild flu-like symptoms for 6 to 12 hours right after the treatment. This is not the flu—it is the body’s response, which indicates that the immune system is being activated. After these symptoms subside, almost all patients report less pain, and a sense of well-being. It has been observed that patients who react with flu-like symptoms after the vaccination do clearly better and show more benefit from the therapy than those patients who cannot amount any flu-like symptoms at all. All patients who went in complete remission always experienced flu-like symptoms. In the past 25 years, more than 1,000 clinical trials and thousands of scientific articles have been published on induced total-body hyperthermia and localized hyperthermia in the peer-reviewed medical literature. Hyperthermia has also been studied for chronic pain, asthma, and other chronic or recurrent respiratory infections, urinary tract infections, and immune deficiency. More than 700 research studies have focused specifically on cancer treatment using total-body hyperthermia. Research on fever therapy for cancer has been performed in medical schools and research centers since the 1980s. These studies have been conducted primarily in the U.S., Germany, and Japan, but also in Australia, China, Denmark, Italy, the Netherlands, New Zealand, Norway, South Korea, and other countries. Hyperthermia can be used as the primary form of treatment or safely applied in combination with conventional therapies such as chemotherapy or radiation. American research has been conducted in FDA-approved studies at centers such as the Mayo Clinic, University of Pennsylvania, University of Texas, and Duke University. These studies reflect a global dialogue between researchers across the world that has systematically defined effective fever therapy. Controlled studies have documented that chemotherapy or radiation in combination with total body hyperthermia becomes more effective, often with fewer side effects than chemotherapy or radiation alone. In the European Union, this combination therapy is widely available at numerous major cancer treatment centers in cities such as Amsterdam, Hamburg, Munich, Rotterdam, Stuttgart, and Utrecht. Comprehensive therapy — At the Medical Center Cologne, total-body hyperthermia is usually provided in combination with local hyperthermia, injections for Immune restoration, mistletoe injections, and IV nutrients for immune restoration. This therapy enables the immune system to better identify cancer cells and targets efforts to destroy them. Low intensity — Controlled fever is maintained at a moderate temperature to safe-guard the well-being of the patient. Maximum temperatures range from 38.5 C to 39.5 C.
Carefully-staged treatment — Temperature is gradually increased for three hours and then, after a plateau of about one hour, allowed to return to normal over the course of one to two hours. The average treatment lasts four to six hours in total. Optimal timing — A major difference with other hyperthermia protocols is the timing sequence. Namely the induced total-body hyperthermia mobilizes the immune system and then the immune system is augmented by the Immune restoration vaccinations. Thus, the body receives millions of its own activated dendritic cells, timed to work together with fever-induced immune system activation. An absence of side effects — This process involves the body’s innate immune responses. The treatment is accomplished with almost no disruption or side effects — typically less than one day of mild flu-like symptoms at most. Primary therapy — This timed approach is almost always effective in restarting and enhancing immune function and competence. This method harnesses the biological healing power of fever in the treatment of cancer patients. Once the immune system is engaged, the body begins destroying cancer cells from within. This reduces the need for medication and stabilizes the body against further deterioration. These gains provide the basis for a sense of well-being, improved health, and healing, even in many patients with Stage III and IV (end-stage) cancer. Complementary to conventional treatment — Fever-range, total-body hyperthermia can be applied as part of a comprehensive immune therapy program or in combination with conventional therapy such as chemotherapy or radiation. The majority of studies have focused on this combination treatment. Research has shown that hyperthermia increases the effectiveness of conventional therapy with fewer side effects than chemotherapy or radiation treatment alone. Also, conventional therapies sustain their efficacy when given in combination with hyperthermia. In the European Union, this type of combination therapy is widely applied in most major cancer treatment centers. In total body hyperthermia, the patient’s core body temperature is slowly increased to about 102.2° F (39° C) and sometimes even higher to 104° F (40.0° C) if it is medical appropriate. The immune shift is triggered by an impulse from deep within the brain stem in the hypothalamus. This area of the brain contains the command center for our most basic functions, especially those our bodies carry on without our conscious awareness such as breathing, blood pressure, and core body temperature. This command center guides the autonomic nervous system, which functions “automatically.” Fever is triggered from deep within the most ancient area of the brain, also present in all mammals, which demonstrates how fundamental fever is to our functioning. 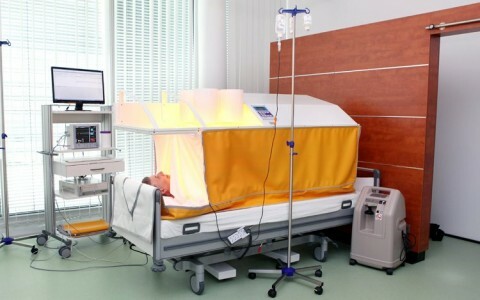 Total-body hyperthermia treatment is used to re-launch and activate cells of the immune system. These defenses increase targeted efforts to destroy the cancer through cytotoxicity. This selective toxicity by immune cells targets malignant cells, resulting in tumor cell death (necrosis and apoptosis). Healing occurs as the cancer load is lowered through improved immune activity. In sum, the fever primes the immune system to destroy cancerous cells and triggers increased immune responses throughout the whole body. I was diagnosed with colon cancer and that spread to my liver. Although I did well on the chemotherapy, the oncologist made it clear that treatment was palliative and not a cure. So we made an appointment for a consultation in Cologne. When we learned that Dr. Gorter’s treatment could be used together with chemotherapy, we decided to do that as well. I began the total body hyperthermia and Immune restoration therapy in Cologne. Kluger MJ. Fever: Role of pyrogens and cryogens. Physiol Rev. 1991; 71(1): 93–127. Roberts Jr NJ. The immunological consequences of fever. In: Mackowiak PA, ed. In Fever: Basic mechanisms and management. New York: Raven. 1991:125. Roberts Jr NJ. Impact of temperature elevation on immunologic defenses. Rev Infect Dis. 1991; 13(3): 462–72. National Library of Medicine, MeSH Database, available at http://www.ncbi.nlm.nih.gov/sites/mesh. Accessed 07-20-1 Kleef R, Jonas WB, Knogler W, Stenzinger W. Fever, cancer incidence and spontaneous remissions. Neuroimmunomodulation. 2001;9(2):55-64. Kleef, R. & Hager, D. Incidence of Malignancies and Missing History of Fever in Baronzio, G.F. & Hager, E. (2006). Hyperthermia in Cancer Treatment: A Primer. New York: Springer US. Laurence JZ. The diagnosis of surgical cancer (Lister Prize say for 1854). London: Churchill. 1854; 56. Dietzel F. Basic principles in hyperthermic tumor therapy. Recent Respite Cancer Res. 1983;86:177-190. Kerner T, et al. Whole body hyperthermia: a secure procedure for patients with various malignancies? Intensive Care Med. 1999 September;25(9):959-965. Kraybill WG, et al. A phase I study of fever-range whole body hyperthermia (FR-WBH) in patients with advanced solid tumours: correlation with mouse models. Int J Hyperthermia. 2002 May-Jun; 18(3):253-266. Atanackovic D, et al. Patients with solid tumors treated with high-termperature whole body hyperthermia show a redistribution of naive/memory T-cell subtypes. Am J Physiol Regul Integr Comp Physiol. 2006 Mar;290(3):R585-594. Epub 2005 Oct 27. Wehner H, von Arden A, Kaltofen S. Whole-body hyperthermia with water-filtered infrared radiation: technical-physical aspects and clinical experiences. Int J Hyperthermia. 2001 Jan-Feb; 17(1):19-30. Doering TJ, et al. Cerebral autoregulation during whole-body hyperthermia and hyperthermia stimulus. Am J Phys Med Rehabil. 1999 jan-Feb; 78(1):33-38. Bedrosian I, et al. Intranodal administration of peptide-pulsed mature dendritic cell vaccines results in superior CD8+ T-cell function in melanoma patients. J Clin Oncol. 2003 Oct 15;21(20):3826-3835. Franckena M, et al. Radiotherapy and hyperthermia for treatment of primary locally advanced cervix cancer: results in 378 patients. Int J Radiat Oncol Biol Phys. 2009 Jan 1;73(1):242-25-. Epub 2008 Nov 5. Bull, JM, et al. Fever-range whole-body thermal therapy combined with cisplatin, gemcitabine, and daily interferon-aalpha: description of a phase I-II protocol. Int J Hyperthermia. 2008 Dec;24(8):649-662. Kappel M, et al. Somatostatin attenuates the hyperthermia induced increase in neurtrophil concentration. Euro J Appl Physiol Occup Physiol. 1998;77(1-2):149-56. Kappel M, Poulsen TD, Galbo H, Pedersen BK. Influence of minor increases in plasma catecholamines on natural killer cell activity. Horm Res. 1998:49(1):22-26. Wust P, et al. Feasibility and analysis of thermal parameters for the whole-body-hyperthermia system IRATHERM-2000. Int J Hyperthermia. 2000 Jul-Aug;16(4):325-339. Zellner M, et al. Human monocyte stimulation by experimental whole body hyperthermia. Wien Klin Wochenschr. 2002 Feb 15;114(3):102-107. Robins HI, et al. Phase I clinical trial of melphalan and 41.8 degrees C whole-body hyperthermia in cancer patients. Clin Oncol. 1997 Jan;15(1):158-164. Oehler R, et al. Cell type-specific variations in the induction of hsp70 in human leukocytes by feverlike whole body hyperthermia. Cell Stress Chaperones. 2001 Oct;6(4):306-315. Brockow T, Wagner A, Franke A, Offenbacher M, Resch KL. A randomized controlled trial on the effectiveness of mild water-filtered near infrared whole-body hyperthermia as an adjunct to a standard multimodal rehabilitation in the treatment of fibromyalgia. Clin J Pain. 2007 Jan; 23(1):67-75.